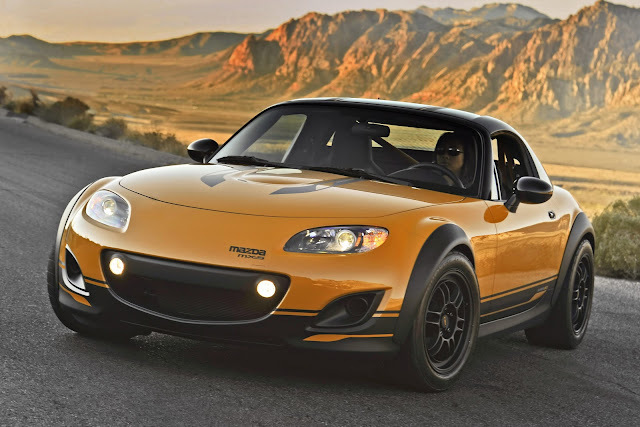 As part of Mazda's 2010 worldwide celebrations of 20 years of Roadster, Mazda USA created the Super20 concept. 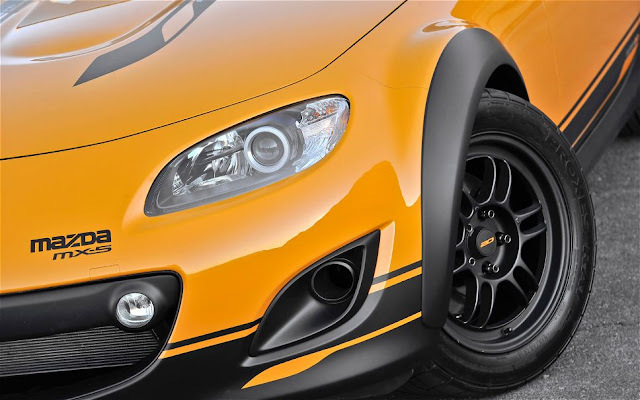 Unveiled at that year's SEMA show (Speciality Equipment Market Association), the Super20 was designed to give the Roadster a tough new image, and showed how just a few changes can totally transform the look of the car. 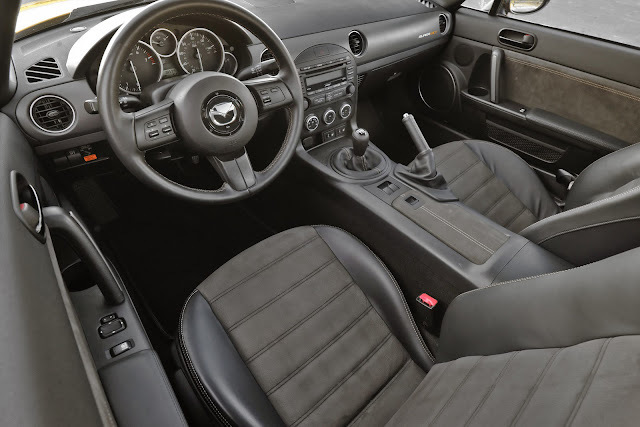 "Celebrating its 20th Anniversary, the MX-5 has been re-imagined with a darker, edgier attitude in the MX-5 Super20. It's a purposeful combination of street-tough style and motorsports inspired attributes. 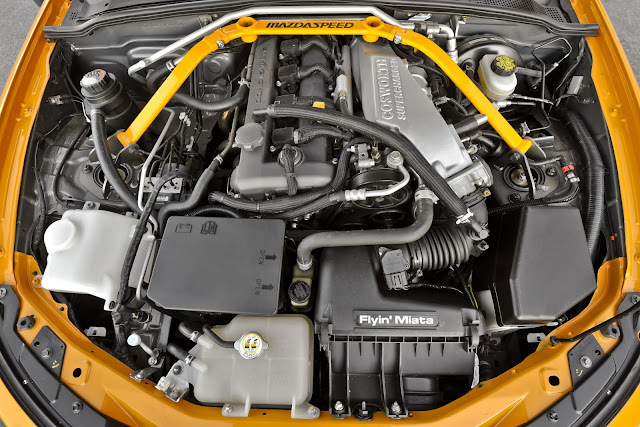 This third generation vehicle acknowledges the iconic first-generation with modifications such as a supercharged cosworth engine, small diameter wheels, more substantial tyre profile and wider fenders. 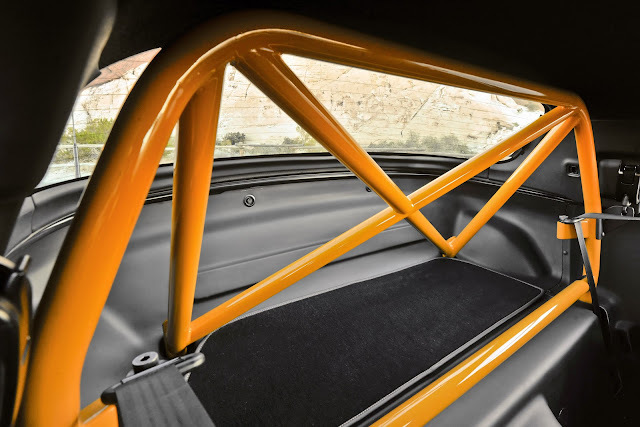 A hardtop has replaced the soft top and the interior stripped down and fitted with a roll-bar lending a GT inspired look and feel. The seats have suede inserts and channel stitching, providing improved grip for the driver. Orange contrast stitching highlights the sporty seat profile as well as providing a polished look throughout. Coordinating with the exterior graphic treatment which plays off the black and storm grey exterior." Those with a keen eye will also spot the custom painted headlights and rear light clusters. 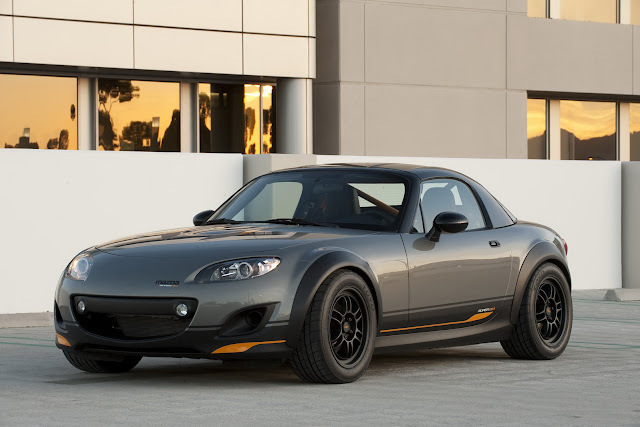 Super20 also has modified doors that use an exterior door handle copied from the first generation NA roadster. The front foglights are also relocated to the centre grille to allow the original mountings to be used to channel air for brake cooling. The soft top was completely removed to allow for the roll-bar fitment, and also creates storage space on the rear deck. After making its debut in 2010, the Super20 reappeared at the following years show with a new orangey yellow exterior colour scheme. Also, if you're a fan of the stick on wheel arch extensions, Goodwin Racing can sell you some. You can watch Super20 in action in the video below.